Dirty hit this. Dirty hit that. Cheap shot. Uncalled for hit. Undisciplined. Out of control. Penalties and game misconducts. Fights with unlikely characters (Crosby vs. Giroux). Harsh and not-harsh-enough suspensions and fines. It seems as though the 2012 NHL Playoffs has turned into a showcase of WWE Divas. Fingers are being pointed left and right with criticisms up the Ying-Yang; excuses and scrutiny coming from all sides. While it is unknown how the Minnesota Wild would handle these rough games and hard hits (their Playoff presence, er, non-presence, is a sore spot for all Wild fans), Minnesotans would no doubt hold them to a higher standard. Why? Because of Jack Jablonski. Before news of Jack’s accident went global, it first hit home. Every Minnesotan seemed to know someone who knew the Jablonski family or who had a cousin whose kid went to Benilde-St.Margaret’s, or who once saw Jack play a Pee Wee game. Overnight, Jack went from a regular high school kid on another Minnesota high school hockey roster to a household name no one could stop saying. 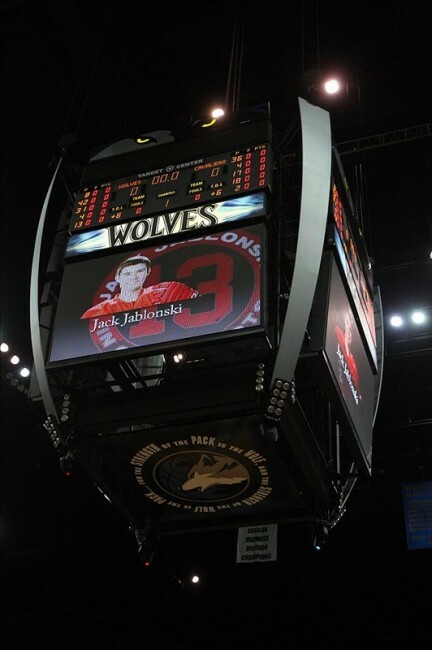 Along with Jack’s high school community (Benilde-St. Margaret’s), hockey players and parents across the state jumped in to show their support for the Jablonski family. According to Jack’s Caring Bridge guestbook, a handful of Wild players and other NHLers sent their thoughts and prayers (list includes: Zdeno Chara, Jamie Langenbrunner, Mike Komisarek, Kyle Okposo, Chris Higgins, Jack Hillen, Mikko Koivu, Nate Prosser, Casey Wellman, Matt Kassian, Marco Scandella, Nick Johnson, Erik Johnson, and The Pittsburgh Penguins). His Caring Bridge photo album even shows a picture with the Sedin twins and their Vancouver teammates. And in numerous local news reports, it was shared that NHLers from around the league had called him, sent him personal notes, and autographed jerseys. Visits from Minnesota Gopher players, as well as Wild players, were also noted. Why? Because it could have been them. And they know it. Despite efforts to eliminate hits to the head, control checks from behind, bring awareness to dangerous hits, and decrease the number of concussions in the NHL, it doesn’t seem to stick. Players are still hitting hard. Players are still getting hurt. But in Minnesota, there has been an effort to start young. To teach kids the proper way to check. And it’s all thanks to Jack Jablonski. The Minnesota State High School League went so far as to change the rules midway through the season. Teams and players pledged Jack’s Pledge (video below) and played every game thinking about Jack Jablonski. The Minnesota Wild, players, coaches, and even GM Chuck Fletcher joined forces with the rest of Minnesota on Hockey Day Minnesota (January 21, 2012), to support Jack. Sixteen hours of games, high school, college, and Wild vs. Stars, but the scores took a back seat to the efforts off-ice to raise money for Jack’s treatments and rehabilitation. Actually, the entire day was dedicated to Jablonski and money raised went to the Jack Jablonski Trust Fund. The Minnesota Wild chipped in on the online auction and offered exclusive “’experiences’ such as lunch with General Manager Chuck Fletcher and Head Coach Mike Yeo, or a special night in the ‘Elite Seats’ on the glass between the team benches, with proceeds going to the Jablonski family. The top totals went to a Day at the Xcel Energy Center ($5,800) and a 16-person suite donated by Dany Heatley, including a visit with Heatley after the game ($4,550)” (News Minnesota Wild). The Wild’s generosity went beyond a community effort. It was for a home-town boy who had the talent and determination to make it to the NHL. Jack’s hit echoed in drafty old rinks, brand new multi-ice complexes, and the Xcel Energy Center. Players, Wild and otherwise, made promises to play smarter, safer. Minnesotan’s aren’t buying “Because it’s the Cup,” as a cop-out for cheap shots, unnecessary punches to the head, and even hair-pulling. And next year, or whatever year the Wild make a Playoff run, Minnesotan’s will wave Jack Jablonski #13 bracelets in the face of any Wild player who hits an opposing player from behind or anywhere near the head. Strip away all the excuses. Doesn’t every player, parent, coach, and fan want the same thing; an end to career-ending and life-threatening hits? The Minnesota Wild claimed to want that. Minnesota will be watching them next season to see if Jack’s story still hits home. *Jack Jablonski’s high school team, Benilde-St. Margaret’s Red Knights, went on to win the 2012 Boys’ State High School Hockey Championship in Class AA. It was all for Jack.